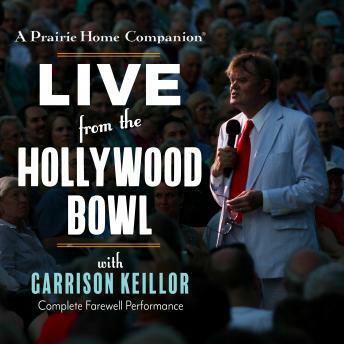 After 40-plus years of delighting radio audiences each Saturday night with America's favorite live variety show, A Prairie Home Companion founder and host Garrison Keillor bids farewell with an unforgettable performance from the Hollywood Bowl in Los Angeles, California. It's a duet singing extravaganza, with Sara Watkins, Sarah Jarosz, Aoife O'Donovan, Heather Masse, and Christine DiGiallonardo joining Garrison on time-honored American ballads, British Invasion romps, country-western weepers, and Broadway classics. Plus: The Royal Academy of Radio Actors, Tim Russell, Sue Scott, and Fred Newman, with L.A. tales and sound effects straight from rush hour on the 101; Music Director and pianist Richard Dworsky moves wondrously from stride and spirituals through surf instrumentals and a bit of Rock n Roll; a special sendoff from President Barack Obama; and one last update on the News from Lake Wobegon, the little town that time forgot, and the decades cannot improve. As expected from Garrison, it is high quality entertainment. However, I would have preferred less music and more sketches and banter.